Over the past couple of days, with my homeroom, I have tried a few strings of numbers to bring out the different ideas that are important when thinking about growth patterns and finding any term in a sequence, Here and here. Both days brought out many great ideas, conversations, and disagreements, however I couldn’t help but feeling the ideas we talked about in two days, could have been achieved in one and felt a little more connected. I knew it was completely the way I posed the problems, so when my second class came in yesterday, after missing a couple days of math due to testing, I was excited to try and adjust my previous work. After that, I asked them to to count by 3’s starting with 6 and stopped them at 15… Asked for the 10th term and got, as expected, 30 and 33. Then the conversation took off with proofs and some really important ideas that was hoping would emerge. I love it when the class is practically divided in half on an answer, we had the 30’s and the 33’s. I asked a 30 to explain how he got the answer and he quickly said 3 x 10=30. I saw a lot of agreement, so I asked for a 33 to share their reasoning. A student said that we “need the beginning number, three, to find out where the tenth one is. 3 x 10 is 30 but then you started three ahead of that so you add 3 to 30.” I wrote that down on the board. A student then said something that made me have a realization, “It shouldn’t change because you are still doing 10 jumps of 3, so it HAS to be 30. 33 is 3 x 11.” In my last class I had a student who kept insisting that the 10th term remain the same no matter where we started and I could not figure out what they were trying to articulate. NOW, I understand. 30 will always be the distance between wherever we start in the sequence and the 10th term, but not the tenth from the true beginning. AH HA! I always hate to say that time got the best of me, but I had missed this group for 2 days of math and I saw this conversation going lonnnnng so I had them write those ideas down in their journal to kick off our class on Monday! I love when I have the chance to refine ideas that don’t go exactly as I had hoped they would, especially when I know it was completely how I posed the problem or asked the question. After a couple days of talks not connecting as I hoped they would, third time was a charm! 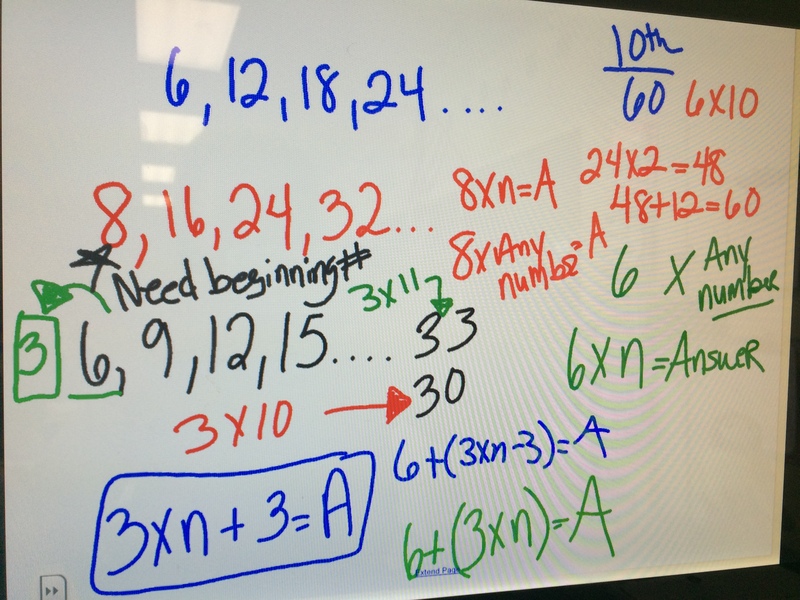 This entry was posted in 5th Grade, Number Talks, Patterns and tagged 5th Grade, number talk, Patterns on May 30, 2015 by mathmindsblog. This is going to be a number talk for my 9 and 10 grade students next year – but it will lead to different places for Alg 1 sudents and geom. Alg 1 will then begin to create their own number strings; geom will do visual patterns. I love the way you can see your kids’ understandings begin!